Halifax's proposed CFL franchise now has a name — the Atlantic Schooners. 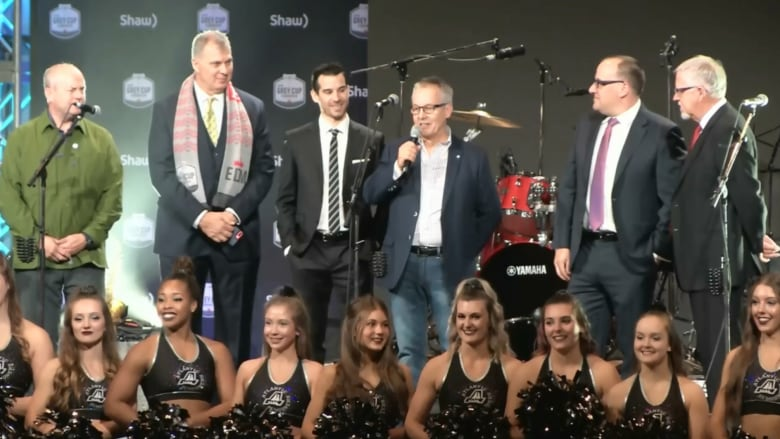 "I'm happy to announce that the 10th team in the CFL will be known as the Atlantic Schooners," John Ryerson announced to thunderous cheers from hundreds of fans Friday night. Ryerson spoke at the annual Grey Cup East Coast Kitchen Party. He is the organizer of this longtime Grey Cup social, designed to bring an East Coast flavour to Canada's big game. The name was picked in a contest and already has a history. The Schooners was to be the name for a proposed CFL team in the 1980s, but that dream never materialized. "I love the name. I was hoping it was going to stay Schooners," said Daryl Shipman from Winnipeg, clad in a blue Schooners jersey. "It epitomizes the East Coast, sailing ships and the Maritime aspect of it." Leslie-Anne McKenzie of Calgary, also in Schooner Blue, agreed. "[It's] absolutely the right name. This is excellent news for the league," she said. "The Schooners only makes sense because it's history." CFL commissioner Randy Ambrosie said the CFL is keen to have Halifax become its 10th franchise. "Ultimately, the big hurdle is the stadium," said Ambrosie. "We're totally committed to their efforts to get that 10th team," he said. "For many of us, that's been a dream now for decades the idea of this truly coast-to-coast Canadian Football League." "[It's the] first time I heard about Halifax to be honest with you," said Ottawa Redblacks receiver R.J. Harris. "I don't know anything about it." If Halifax gets a CFL team, should taxpayer money help pay for a stadium? "I heard the night life is pretty good," he said. "I've never been, but I think I might go in the coming months." Calgary Stampeders linebacker Jamar Wall, from Texas, said, "I don't know anything about Halifax. "I'll probably be long gone before that [franchise] happens, but good luck to the guys who could potentially be there."